Infographic is not an unique feature in sports. In fact, sports may be the field that uses infographic most efficiently. Among sports, basketball and baseball are the ones that use infographic most often. Infographic in sports is used widely in showing various records and statistics. Infographic, having the advantage of visualizing statistics in neat and organized way, helps readers to view substantial amount of records easily by putting them in visualization rather than mere words and numbers. Picture above is appropriate example to show advantages of using infography. You can see how the information in the source seems so boring, and infography, in contrast, is certainly much more attractive. The infography above emphasizes its main theme in a way that everybody can recognize as soon as he/she sees it. 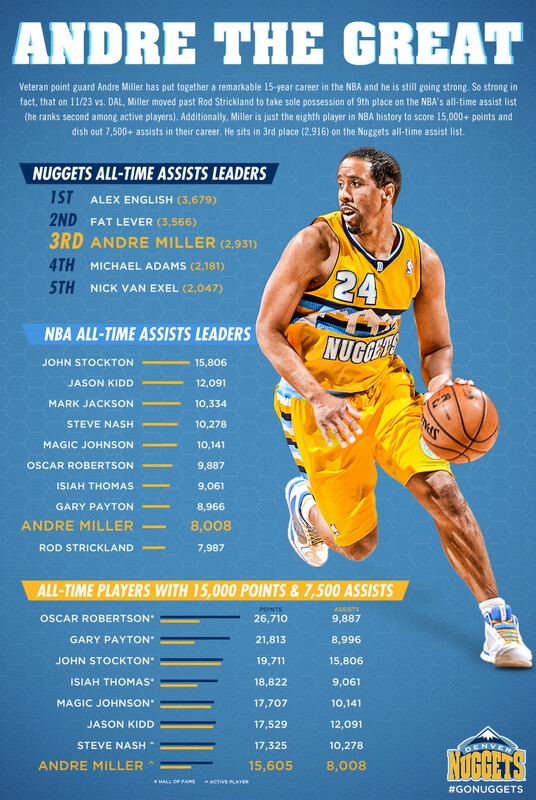 “Andre the Great.” This infography is obviously praising numerous records established by Andre Miller, the basketball player. Just below the title, there are several lines you can see, explaining the statistics below. Those lines are the ones that i referred to, as “mere words”, just as words shown in the source page. Those letters with relatively small sizes are marking that they are not that important, since all the information is shown below in clearer and more distinctive way. The orders of records from 1st to Andre Miller and the number of those records make viewers easier to understand what kind of records did he achieve, and about where his records is positioning at. For last two records, bar graphs are making the point more clearly. Such infographic gives clear idea of what kind of information it wants to convey to its readers. Also, picture of Andre Miller on the right side cannot be neglected. Such visual aids cannot be provided in writing. The picture not only shows the appearance of the player, but also tells his back number and the emblem of his team, which is, by the way, Denver Nuggets.